Its just another check off the list as Michael Phelps won his 3rd Gold medal at Beijing while breaking another world record, finishing at 1.42.96 in the 200-meter freestyle. South Korean Park Tae Hwan won the Silver with a time of 1.44.85, while American Peter Vanderkaay got the Bronze with a 1.45.14. This was no surprise for anyone watching. The second that Phelps surfaced, he was already a half body length ahead. There is not a whole lot to say about this race except that Phelps was the best prepared. Whether or not Phelps is such a good swimmer because he practices it on the Wii is another debate for another post. Do they even have swimming on Wii? They did a special piece on Phelps before tonight’s coverage began in which Phelps mentioned that he must eat up to 10,000 calories a day. For breakfast that includes 3 fried-egg sandwiches, cheese, lettuce, tomatoes, fried onions, and mayonnaise, an omelette, a bowl of grits, and three slices of french toast with powdered sugar, all washed down with 3 chocolate chip pancakes. My wife Brit pointed out that his diet is my “dream diet” and believe me, she aint kidding. What more could a man ask for than to eat lots of egg sandwiches and pancakes for breakfast? The only thing missing is deep-fried bacon. But I’ve completely gotten off topic. 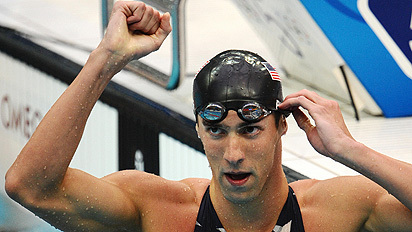 Besides eating, all Phelps says he does is swim and sleep. And it must be hard enough when his pet bulldog snores extremely loud. Congratulations to Michael Phelps. Now I’m going back to swimming laps in my blue-toned plastic pool in my back yard. This entry was posted on August 11, 2008 at 10:43 pm and is filed under 2008 Summer Olympics with tags Aaron Peirsol, Egg Sandwiches, Michael Phelp's Breakfast, Michael Phelps, Michael Phelps Diet, Natalie Coughlin, Peter Vanderkaay, Phelps Egg Sandwiches, Phelps wins 200-meter freestyle, Vanderkaay wins silver in 200-meter freestyle. You can follow any responses to this entry through the RSS 2.0 feed. You can leave a response, or trackback from your own site. Okay – I wasn’t going to watch much of the Olympics this year. Yet last night, I watched May-Treanor and Walsh absolutely obliterate the Cubans in beach volleyball; saw the Chinese men’s team do ungodly things with their bodies during the floor routine in gymnastics; and watched Phelps capture gold with a breathtaking swim that gave me goosebumps – and I don’t even like wading pools. And I still haven’t watched any of the Redeem Team. I had a poptart for breakfast. And it lasted me until lunchtime!